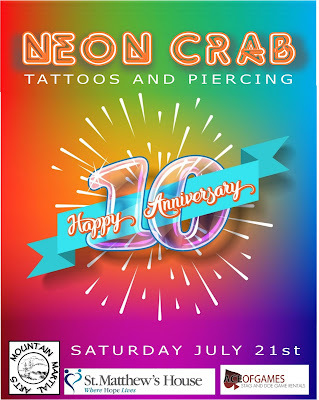 Neon Crab's 10th anniversary celebration. 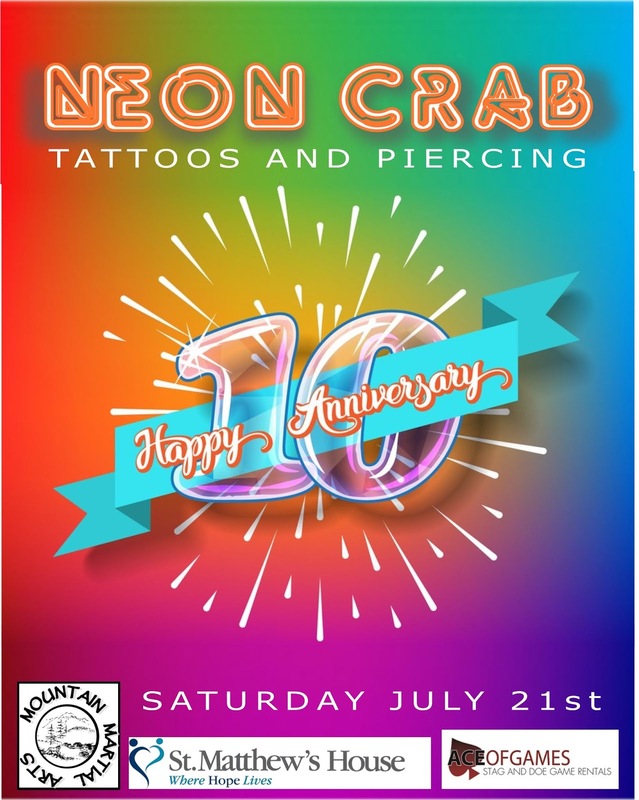 As Neon Crab reaches it's 10th Anniversary in business, we are hosting a celebration for you...our awesome clients, friends, family, and the community that has supported us for 10 years!! So on Saturday July 21st, come on out and enjoy the fun. There will be giveaways, temporary tattoos for the kids, real ones for the adults, a b.b.q. on site, street art, live demonstrations and so much more!! Our friends and community partners will be part of the fun too, as they bring fun activities, and gift certificate give aways, and even test your martial arts skills with board breaking from Mountain Martial Arts. And of course, as always.....HALF PRICE PIERCINGS all day long as part of our anniversary celebration!! This is a free event and will be held in the parking lot of the Neon Crab at 290 Barton St. in Stoney Creek. So come on out, check out the great performances, have some great food, say hi to your favorite artists, and get yourself a new piercing for half price!! !